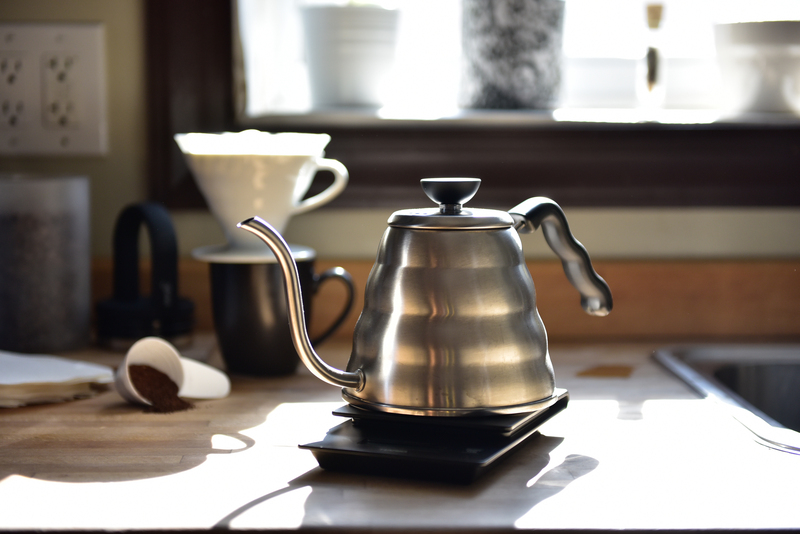 If you’re trying to perfect your pourover game, you might need to take a good long look at your kettle. Is it being the best kettle it can be? Or is it doing you dirty? Traditional kitchen kettles often have a wide spout that allows water to pour out quickly or in spurts. For making tea or filling hot water bottles, this is not really an issue. But when you’re carefully crafting a pourover, there’s nothing worse than nailing the ratio and grind size, only to ruin the cup by dumping water over the grounds, agitating them unnecessarily and getting an uneven extraction. Two words: “Gooseneck kettle.” The thin, curved spout makes for a smooth, steady flow rate and the shape gives you maximum control over where the water goes. When brewing a pourover, it’s important to pour with precision. With a gooseneck kettle, it’s way easier to wet all the grounds evenly with a slow, steady, circular pour. This gives you a more even, consistent extraction, resulting in a tastier cup. The Hario Buono Kettle is phenomenal. I’m fairly new to pourover and it’s been great. I think I had a metal kettle in the past, but, I remember thinking the inside did not stay pristine for me, like brand new, so I switched to glass. With glass, I feel more in control because I see exactly what’s happening, including a rolling boil (although, I guess you can also hear the boil, see the steam, hear a whistle). Is there something you have to do (rinse with) the inside of a metal kettle to keep it like new?